On this date, May 1, the Illuminati were founded. It could be worse. They could have been the Bee order or perhaps the Covenant of Perfectibility. OK. I’m pulling your leg. The Illuminati actually were originally the Covenant of Perfectibility, which sounds just as bad in German: Bund der Perfektibilisten. 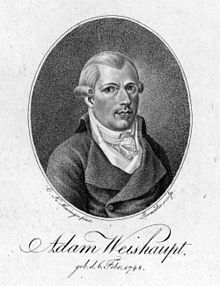 The founder, Adam Weishaupt, later decided this name sounded too weird so he changed it to the Illuminati after giving what in his life passed for serious thought to the Bee order. Clearly Weishaupt was a very poor judge of what sounded too weird. Also of who might be best suited to lead mankind to perfection. Like many people, he had a bad experience with the Catholic church, most particularly the Jesuits, but instead of blaming individuals he somehow turned his wrath on the doctrine of human frailty and thus led mankind into a rich and abundant new era of silly conspiracy theories. No good conspiracy theory doesn’t feature the Illuminati somewhere, along with the Rosicrucians, the Prieurs de Sion, Freemasons, Jesuits, and a smattering of aliens or something, combined in any order you like, allied, competing, both or neither. Years ago my grad school flatmate found me a book on “the conspiratorial view of history” that didn’t just believe all the conspiracy theories, it combined them all. Curiously, the author didn’t believe the Kennedy assassination was a conspiracy, which given the rest of the book made me wonder if might be the one real one. Yeah, I bet. Young, rich and docile. And preferably anti-Semitic, anti-Catholic, anti-Mason and pro-Weishaupt. I enjoy a good outburst of paranoia as much as the next guy, especially one with grand historical events as a backdrop. But I adhere firmly to the rule never to ascribe to conspiracy what can be ascribed to stupidity.